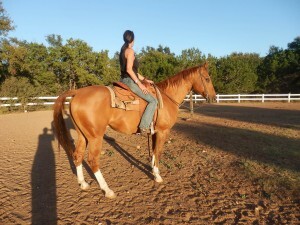 ( sale pending) This beautiful red Dunn horse is beautiful. Dundee stands 15 2 and is 9 years old. He came from a working ranch that was sold so our buyer was able to get him for us. Once in a while we get one of these “star” horses. Dundee has proved to be just that! Miss Pam said” boy this is a good horse with a great handle” He has a good stop and a good mind. 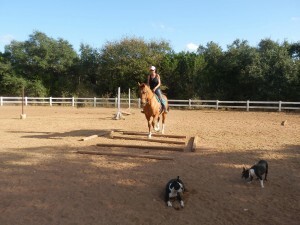 As you my have read, Pam was in the Hunter Jumper world in Minnesota and then when we came to Texas. 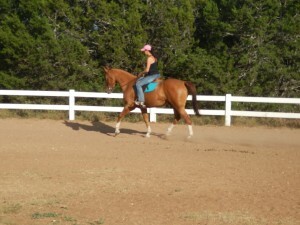 She actually won many classes here in Texas until switched to Western Pleasure horses. We wanted to see if Dundee would “go English” and he astounded us. 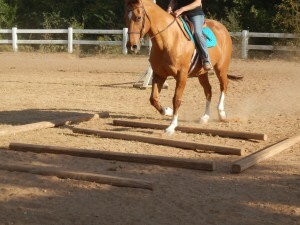 Not only did he go, he is almost a “perfect” mover for those of you that know English terminology. Pam rode him through all the paces English, then our little rider Evelan, age 10, rode him western as Pam did the first time. 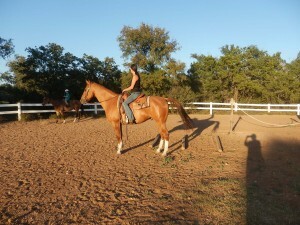 He is a ranch bred gelding with a ranch brand. He has a great stop, a 360 turn and a great neck rein. 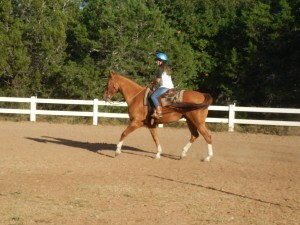 When we put him in English tack, he dropped his head, went over all the tests and was a star!!!! My gosh this is a nice kind horse with amazing talent. We will put him over a few small jumps this week.